The fire is book 4 in Norhtwest Passage Series by John A Heldt. 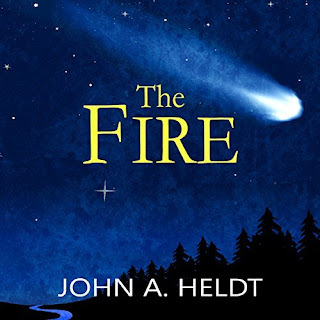 The book is based loosely on the Great Fire of 1910 (Largest Wildfire in US history) and Haley's Comet. In the book Kevin Johnson has just graduated college and goes on a mini vacation to his Recently passed Grandfather's house with his family to get the place ready to put up for sale. While there he finds a secret diary and a time travel portal. The portal can transport him to 1910 and back. He finds out this is how his Grandfather acquired his fortune. Transporting to the future and selling gold from the past.